You might have never heard of space weather. It does not mean that it is rainy, snowy or stormy in space, but similar phenomena happen in space and they sometimes affect our lives. Solar activity is strongly related to space weather, so it also affects the activities of humans. The sun is 4.6 G years old, and it continues to emit heat and light. The energy of the heat and light is produced by nuclear fusion in the sun. The sun mainly consists of hydrogen atoms. Four hydrogen atoms react with each other to produce a helium atom. At that time, the mass loss energy is radiated as heat and light. The heat and light from the sun are essential for creatures on Earth. Simultaneously, the sun also emits X-rays, ultraviolet emissions, and hot ionized gases that are harmful to creatures. Earth has two barriers that protect creatures from harmful materials emitted by the sun. One is a thick atmosphere that prevents X-rays and ultraviolet emissions from reaching the ground. The outer layer of the atmosphere, called the ionosphere, is ionized by X-rays and ultraviolet emissions. The second barrier is a magnetic field. The magnetic field plays a role in reflecting the flow of ionized gas called solar wind. However, these two barriers are imperfect. Solar flares and coronal mass ejections generate a dense solar wind. When it is directed to Earth and the magnetic field in the solar wind is directed southward, harmful materials (ionized gases) penetrate into Earth’s magnetic field barrier to reach the near-Earth space. This affects the operations of artificial satellites and the International Space Station (ISS) outside of the atmosphere. Specifically, high-energy charged particles penetrating an artificial satellite cause the malfunction of electric devices, resulting in abnormal operation. In another case, relatively low energy charged particles charge the housing of an artificial satellite, and a short circuit of an electric device destroys the system. Astronauts are also at risk of being exposed to radiation. 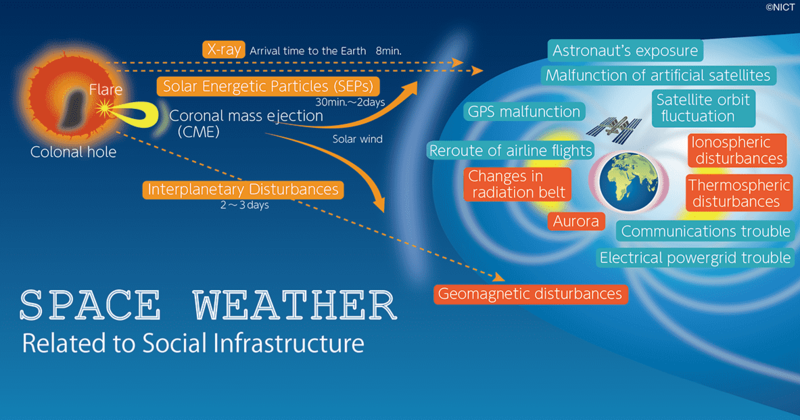 Space weather information is also being prepared for use in aviation operations by the International Civil Aviation Organization (ICAO) in the 2020s. This is most important for aircraft on polar routes because aircraft need to use HF radio communications in the polar region, where the elevation angle of a communication satellite above the equatorial region is too small to use. Moreover, in the polar region, the error of satellite positioning and the exposure risk of the passengers and crew increase. To avoid these risks, polar route operations will be changed or postponed when there are space weather disturbance or when space weather is expected to be disturbed. © National Institute of Information and Communications Technology. All Rights Reserved.